Bahamian conch, red peppers and delicious seasonings make up this house favorite. Petite shrimp, lightly breaded and fried, then tossed in our secret spicy bang bang sauce. Served rare, slice thin topped with wasabi peas. Served with sweet honey soy for dipping. Baked Jumbo mushrooms stuffed with a succulent seafood stuffing, drizzled with our famous creamy crab soup and dusted with parmesan cheese. Golden house made waffle chips, hickory smoked bacon, topped & baked with shredded smoked gouda and drizzled with buttermilk ranch. Gourmet flatbread pizza of the week! Ask your server what delicious combination is cooking this week? 1/2 portion or full. Seven jumbo shrimp rolled in shaved coconut fried to perfection served with a Jicama slaw, crispy fried plantains and a red pepper marmalade. Served with diced tomatoes, onions, jalapeños and crackers. Served with zesty ranch dipping sauce. Potatoes, white Vermont cheddar, yellow cheddar, parmesan & provolone all rolled & deep fried. Served with herbed aioli. Andouille Sausage, chicken, black beans, red cabbage, Boondocks corn relish and cheddar cheese served with a chipotle aioli. Plain or tossed in one of our new signature sauces – Sesame teriyaki, sweet chili, mild, BBQ, or hot!! Classic rich and creamy with loads of clams, potatoes, carrots and celery. Ground beef, diced veggies and a few beans. Yucca, boniato, tomato, bacon, cumin, cilantro, carrots & celery. A very rich and creamy soup, slow simmered for 8 hours and kissed with a hint of creamed sherry. 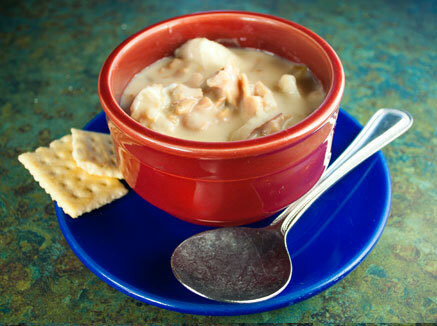 A light cream soup enhanced with lobster pieces slow simmered for 8 hours and kissed with a hint of creamed sherry. Topped with sour cream and a dollop of caviar. Romaine lettuce, iceberg, mixed greens, grape tomatoes, cucumbers, carrots, cheddar jack and your choice of dressing. Add our house-made croutons. Only .50 more! Romaine lettuce, iceberg, mixed greens, carrots, red cabbage, green onion, grape tomatoes, candied pecans, blue cheese crumbles, all “chopped up” & tossed with a citrus vinaigrette dressing. Our Bang Bang shrimp resting on mixed greens with tomatoes, shaved red onion, pineapple, avocado tossed in a citrus soy vinaigrette. Romaine lettuce, iceberg, mixed greens, carrots red cabbage grape tomatoes, sliced avocado, sliced hard boiled egg, diced chicken, hickory smoked bacon grilled pita points & choice of dressing. Romaine lettuce, tossed with parmesan cheese, crunchy croutons and creamy caesar dressing. Romaine lettuce, iceberg, mixed greens, black beans, roasted sweet corn, onion & pepper mix, carrots red cabbage, cheddar jack, grape tomatoes, diced chicken, hickory smoked bacon bits and fresh cilantro coconut dressing. Field greens, roasted red peppers, roma tomatoes, egg and olives topped with feta cheese, pickled red onions, artichokes all tossed in Mediterranean vinaigrette. Caesar, Ranch, Honey Mustard, Coconut Ranch Oil & Vinegar, or Blue Cheese. Or try one of our delicious Mediterranean, Wasabi, or Citrus Vinaigrettes. Take your salad to the next level by adding any one of these proteins to one of our signature salads. Smoked brisket topped with apple jicama slaw & citrus BBQ on a Amoroso roll. sauce with cabbage, tomato & sour cream in soft flour tortillas. Caramelized onions, grain mustard, Swiss cheese, pastrami on marble rye. Swiss cheese, lettuce, roasted tomatoes, whole grain honey Dijon mustard on flat bread, served warm. Red onion confit, blue cheese aioli, arugula on an Amoroso roll. Marinated portabella, oven roasted tomatoes, roasted red peppers, grilled red onion and artichoke, topped with Boursin Cheese, arugula, balsamic mayo served on Dutch crunch roll. Chicken, applewood smoked bacon, smoked gouda, tomatoes, red onion, fresh basil & chipotle on ciabatta. Use any of these gourmet sandwiches with the “You Pick Two” Combo! Made with our Cheesy Cheddar Sauce. three cheeses, melted to perfection. Topped with crab meat & our special blend of seasoning. Topped with lobster, smoked gouda, cheddar and provolone. Topped with smoked gouda, American, cheddar cheese, bacon, drizzled with buttermilk ranch. French fries, topped with melted cheddar, American cheese and dusted with our special seasoning. French fries, topped with crab meat, melted cheddar cheese and dusted with our special seasoning. French fries, topped with smoked gouda, American, cheddar cheese, bacon & drizzled with buttermilk ranch. All sandwiches will be served on rolls with house-made chips. Option of french fries, coleslaw or Boondocks famous bacon ranch potato salad for .49 cents. Substitute sliced apples or mediterranean pasta salad for 1.50. Cooked the way you like it, topped with choice of cheese, lettuce, tomato & onion. Overnight roasted pulled pork, french fried onions and jalapeños, pepper jack cheese and chipotle mayo drizzle. The original cooked just the way you like it! Choice of cheese with lettuce, tomato & onion. 2 burgers, 4 slices of American cheese, & 4 slices of bacon. Cheddar cheese, bacon, caramelized onions & BBQ sauce. Cheddar cheese, caramelized onions & A-1 steak sauce. Blue cheese, blackening spice & bacon. Served fried, grilled, lime peppered, or with blackening spice. Sushi grade tuna served grilled with honey soy dipping sauce. Southern fried pork loin served on a brioche bun with chipotle mayo, pepper jack cheese, lettuce, tomato & onion. Petite shrimp lightly breaded, fried, then tossed in our secret spicy bang bang sauce with cabbage, tomato and sour cream in a soft flour tortilla. Pesto panko seared chicken, tomato, buffalo mozzarella, basil, served on challah bread. 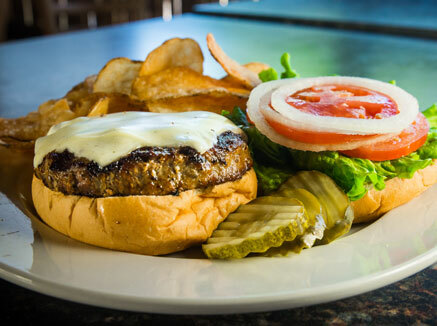 Our signature lunch dishes are served until 3:30pm daily. Corned beef, buttered & grilled marbled rye, swiss chesse, topped with sauerkraut and thousand island. On grilled ciabatta, with smoked turkey, chipotle mayo, field greens and onion. 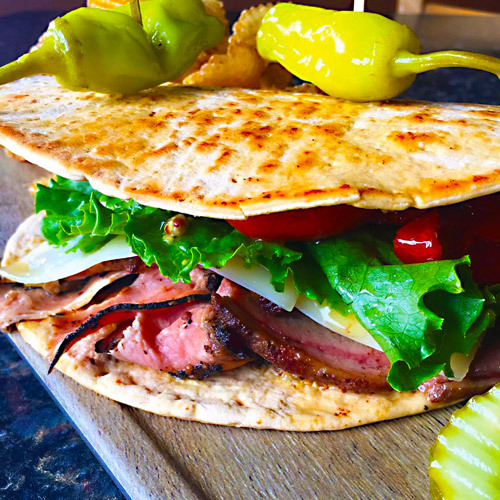 On grilled ciabatta, roast beef, smoked cheddar, lettuce, tomatoes, onion and our horseradish spread. Grilled sourdough, duck bacon, cheddar and smoked provolone. coconut cilantro mango aioli in soft flour tortillas. Gourmet flat bread pizza of the week. Add the 1/2 portion as part of the “You Pick Two” menu. Ask your server what’s fresh this week. 1/2 portion or full. 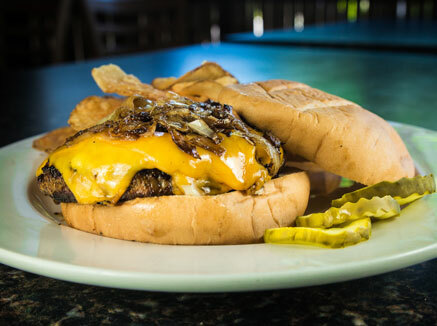 Steak, mushroom, caramelized onion, our special blue cheese spread, scallions, pepperoncini & provolone. 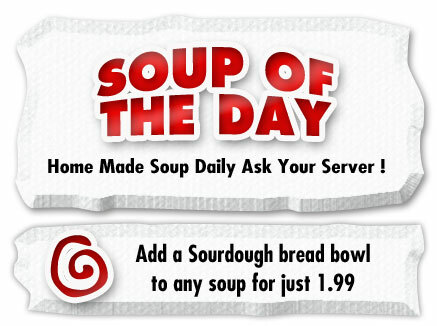 Pair any lunch entrée sandwich with a delicious cup of soup, any signature salad, or our gourmet flat bread pizza of the week – Only 9.98 Make it a bread bowl of soup for 1.99 more.